The daily feed for luxuriant aquarium plants. Optimum, targeted care, provides all vital trace elements which cannot be provided by long-term fertilisers. 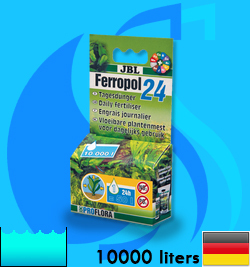 Promotes lush growth, even in delicate aquarium plants. Contains no phosphates or nitrates. Optimum success together with JBL Ferropol (when changing water) and JBL AquaBasis plus (gravel substrate). 1) Reduction of the old fertiliser by 1/3; replace this with 1/3 of the new fertiliser. Wait approx. 3-4 weeks and observe the reaction of the plants. 2) Reduction of the old fertiliser by 2/3; replace this with 2/3 of the new fertiliser. Wait approx. 3-4 weeks and observe the reaction of the plants. 3) Complete discontinuation of the old fertiliser and change-over to the new fertiliser. These measures should generally be carried out on a weekly basis, ideally right after a water change. This achieves better results than fertilising in large doses at longer intervals. JBL AquaCristal UV-C: Does the ultraviolet light destroy active ingredients of my aquatic plant fertiliser? UV-C breaks down the chelates in the fertilisers, which prevent the precipitation of trace elements such as iron, among many others. Therefore, when using a UV-C water clarifier, it is advisable to change over to daily fertilisation and convert the standard dose into a daily application at the beginning. It may also be necessary to increase the fertiliser dose slightly. Traces of iron should at least be detectable prior to the respective next application of fertiliser. Vitamins and other higher grade organic compounds may likewise be broken down. Therefore, when using vitamins, it is advisable to add the fertiliser with the food twice a week. Algae problems in an aquarium can never be traced to just one factor or general condition, and instead, are always the result of a combination of different factors, which include light, fertilisation, water changes – specifically, how often and how much – feeding, fish population and, of course, the specific water parameters. 3) too little fertilisation and too irregular (there should always be traces of iron at least).